One aim of this blog is to educate people about the upper echelons of women’s cycling. Men’s cycling gets so much focus and so much airplay that I feel duty bound to help correct this in some small way. One of the great things about the Olympic Games is that we all get exposed to a myriad of sports we’d never usually pay any attention to, and that includes women’s sport. I personally love to watch track cycling both live and on TV so I thought I’d give a little preview of the Australian women’s track team so when you’re watching in July you’ll know a little about each of these wonderful women. The track cycling events are from 2 to 7 August so make sure you check local programming and tune in. I guarantee you’ll enjoy it. Anna Meares is the only women’s track team member who has any Olympic experience (Jack Bobridge from the men’s squad has also competed at an Olympic Games). In fact this is Anna’s third Olympic Games – in Athens in 2004 she won gold in the women’s 500 metre time trial (an event that is no longer in the Olympic Games) and bronze in the sprint. In Beijing she won silver in the sprint, an amazing feat considering she broke her c2 vertebra (second down from the scull), dislocated her right shoulder, suffered torn ligaments and tendons, a heavily bruised right hip and skin abrasions when she crashed at 65km/h only seven months before the Olympics. I’m really looking forward to seeing Anna race in London but I’m also mindful that she has a lot of pressure on her. She races three events – the sprint, the team sprint with Kaarle McCulloch and the Keirin. You can read more about Anna on her website http://www.annameares.com.au/ and follow her on Twitter @annameares. Kaarle McCulloch will race in the team sprint with Anna Meares. 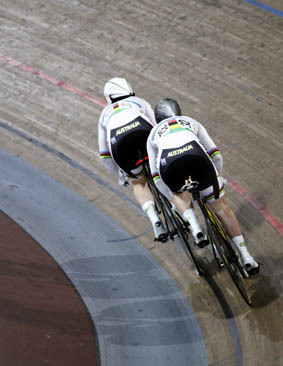 They are a formidable team and will be focused on gold after placing second in the event at the recent Track World Championships in Melbourne. Kaarle has always been a sporty person and decided to try track cycling at the suggestion of her mum. In her own words “My mum…. said to me that I should take track cycling up because physically I was built like Anna and Kerrie Meares. I was adamant however that I was going to be a runner, and that track cycling was lame! I kid you not – within two laps of riding around Hurstville oval (my club’s local track) I had a life changing moment. I just knew that this sport was going to be my life. To this day I have not woken up and not wanted to train – to become better, to be the best, I love it, I live it, I breathe it.” Now how could you not find that inspiring. You can read more about Kaarle on her great website at http://www.kaarlemcculloch.com.au/ and follow her on Twitter @kaarlemcculloch. Like most of the other endurance team members, Josie Tomic from WA is also a road cyclist. On the road she rides for the Lotto-Honda team based in Belgium. Everything I read about Josie leading up to the Olympic selection was about how the London Games was her main focus so it’s great to see that she achieved her goal. Leading up to the Olympic Games she will continue to race on the road for her team and then join the other track team members in a training camp just prior to the Games. Look out for Josie in her signature pearl earrings. I don’t think I’ve ever seen her interviewed without seeing them. She recently became engaged to fellow track team member Jack Bobridge who will race the men’s team pursuit event. She also has a great website which you’ll find at http://josietomic.com/ and you can follow her on Twitter @JosieTomic. Like Josie, Melissa is also a road rider and is part of the Greenedge-AIS team based in Italy. At the recent World Track Championships she won gold in the women’s scratch race and along with her team mates Annette Edmondson and Josie Tomic she broke the world record in the semi-final of the team pursuit. The record only lasted a few minutes as the British team broke the new record in their semi-final before going on to beat Australia in the final. Her results are equally impressive on the road. She finished the 2012 Jayco Bay Classic 1st overall and took out the U/23 Australian Road Championships. Most recently she sprinted to take stage three, and overall victory in the Tour of Chongming Island in China. Like Josie and Nettie, Melissa will be well supported in the team by her boyfriend and fellow endurance track team member Rohan Dennis. She has a website but it’s not up to date so I won’t worry about sharing it with you. You can follow her on Twitter @MelissaMHoskins. Tasmanian Amy Cure is just 19 years old and heading for her first Olympic Games. She’s quite an over-achiever and established herself as one of Australia’s future stars claiming multiple junior national track and road titles, along with gold medals and world records at the Junior World Track Championships in 2009 and 2010. She made her senior World Championship debut in 2011 where she finished 8th in the omnium and 4th in the team pursuit. She claimed bronze medals in the individual and team pursuit at the 2012 London World Cup event. She’s the youngest of the women’s track team members and will be looking to her sporting idol Anna Meares for advice and help at the Olympics. You can follow Amy on Twitter @amylcure. Annette known as Nettie will have plenty of support on hand in the track cycling team. Her brother Alex Edmondson and boyfriend Michael Hepburn are both members of the men’s track team. In fact they are the first sister and brother who’ve been selected for an Olympic Games cycling team. I bet their parents are overwhelmed and will be trackside in August. She began cycling after she was identified by the SA Institute of Sport as having the physical attributes of a cyclist after completing a range of measurements and physical activities at school. After winning multiple junior national and Oceania titles, Nettie claimed her first senior national title in 2011 in the omnium. She backed up the following year to break the Australian record as she claimed the individual pursuit at the 2012 Australian Track Championships. She went on to take gold in the points race and silver in the scratch race. She also rides on the road for Team Jayco-AIS. And she’s smart too. She got a TER of 99.0 in year 12, and is interested in studying medicine and volunteering in areas of need following a successful track and road cycling career. You can follow her on Twitter @NettieEdmondson.